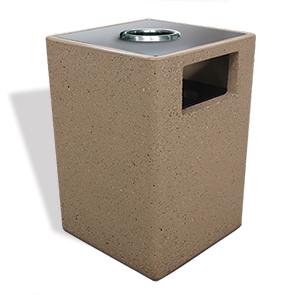 Positively impact waste management efforts by installing these 35 gallon Ash/Trash Receptacles. Perfect for building entrances, the stark design blends the natural ruggedness of concrete with precision crafted powder-coated aluminum creating a smart, clean appeal. The molded in side opening offers plenty of space for hands-free pitch-in disposal and the aluminum top features a 7-3/4" ashtray for safe disposal of smoking litter. A security cable connects to the lid and base, a good deterrent for would be vandals—also very helpful when servicing. Includes polyethylene liner. Constructed from highly durable concrete reinforced by solid steel rebar, this receptacle will maintain its look while withstanding the toughest environments and conditions.